U.S. official tells CNN an air strike close to Iraq-Syria border was carried out by Israel. IDF not commenting. A United States official told CNN on Monday that an air strike on Sunday close to the Iraq-Syria border was carried out by Israel and not by the U.S. or the international coalition fighting the Islamic State (ISIS). Syrian state TV blamed the strike that targeted pro-regime forces and caused multiple casualties on the U.S.-led coalition combating the terrorist group, but a spokesman for the coalition said there were no coalition strikes in the area, which took place al-Harra, southeast of Albu Kamal. The IDF declined to comment on the strike, as per its normal policy. U.S. officials have said that many pro-regime militias that are also aligned with Iran operate in the border area between Syria and Iraq. Israel has in the past been accused of attacks in Syria. Last month, an air strike took place south of the capital, Damascus, and Syrian media said Israeli planes fired missiles at Iranian targets near Damascus. In April, a military airbase belonging to the Assad regime near the Syrian city of Homs was hit with missiles. The Russian army, as well as Syrian media, claimed that two Israeli planes carried out the attack. Netanyahu spoke with Secretary of State Mike Pompeo and Russian President Vladimir Putin over the weekend, two of the key players in influencing Israel's policy and actions over Syria. CNN noted that Sunday's strike was very different from those normally attributed to Israel. Generally, those strikes occur in the western region of Syria, principally in the area around Damascus and Homs. Recently, these strikes have targeted Iran's infrastructure and military presence in Syria. Israel has also allegedly struck shipments of advanced weapons from Syria to Hezbollah in Lebanon in the past. 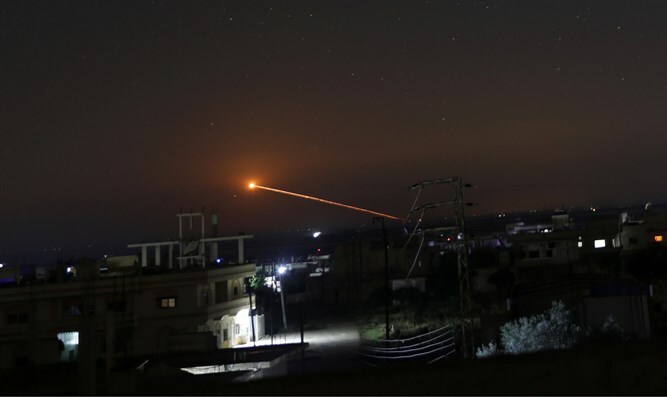 But this attack in Eastern Syria, the report continued, took place hundreds of miles away from that area, and the target -- pro-regime forces -- differs from what would be Israel's usual mark, namely Iranian military positions.